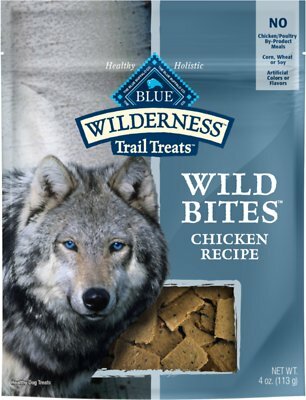 Blue Wilderness Wild Bites are chunks of satisfying chicken blended with some of nature’s most nutritious ingredients. 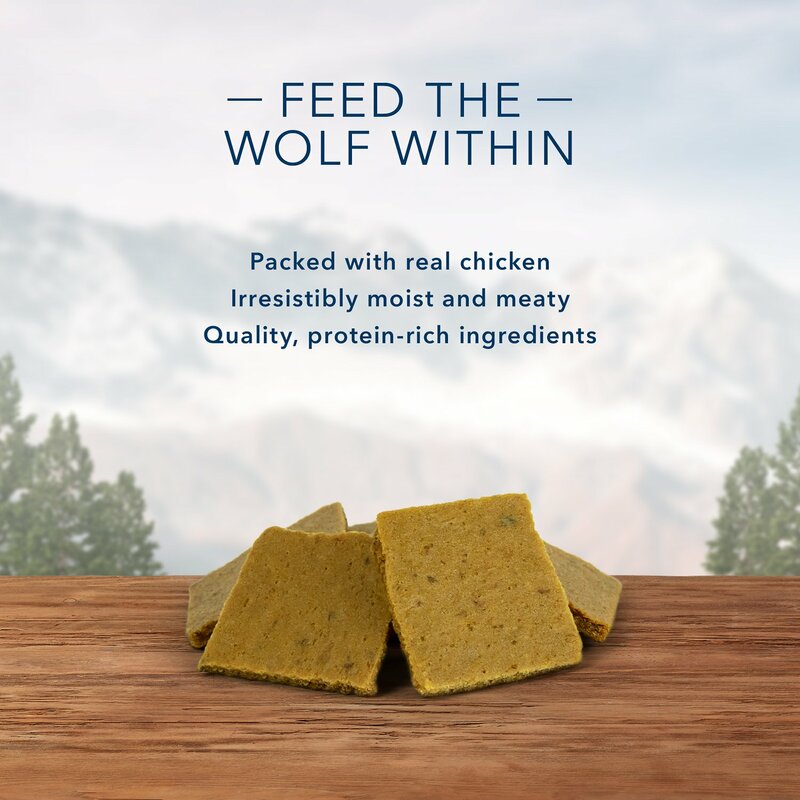 They’re packed with protein and have more than enough taste to satisfy the wolf spirit in your canine carnivore. 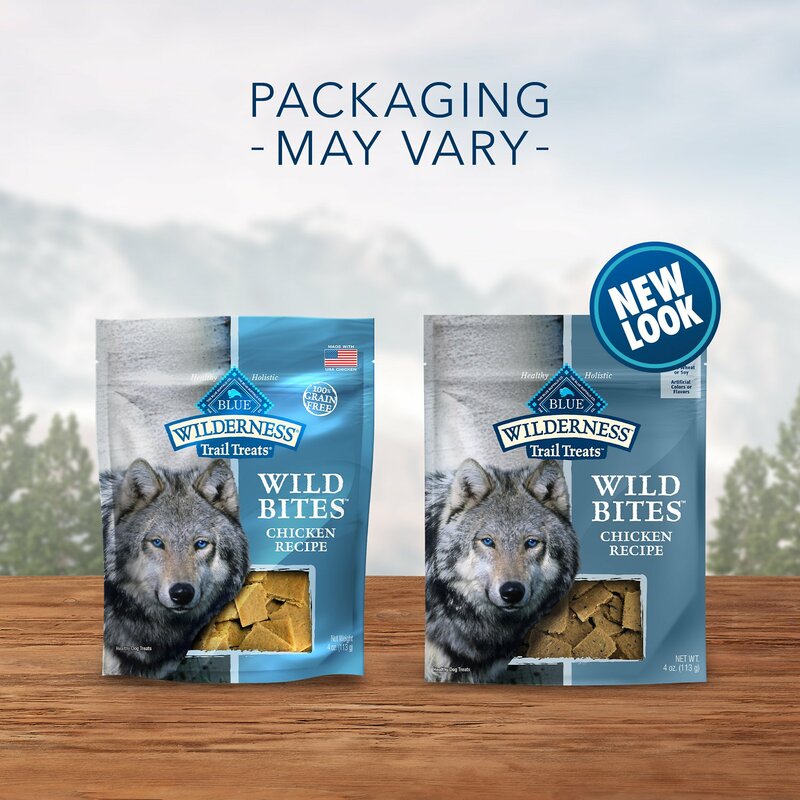 Made with the finest natural ingredients, Wild Bites are a wholesome treat that will help support your dog’s strength, health and vitality. High-quality chicken and highly nutritious ingredients like peas and potatoes make these bites the perfect treat for dogs who are fed grain-free or raw diets. Deboned Chicken, Whole Ground Potatoes, Vegetable Glycerine, Peas, Gelatin, Salt, Natural Smoked Flavor, Preserved with Phosphoric, Sorbic and Citric Acids, Mixed Tocopherols (Source of Vitamin E), Rosemary. 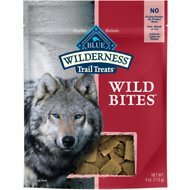 BLUE Wilderness Wild Bites are intended for intermittent or supplemental feeding only. 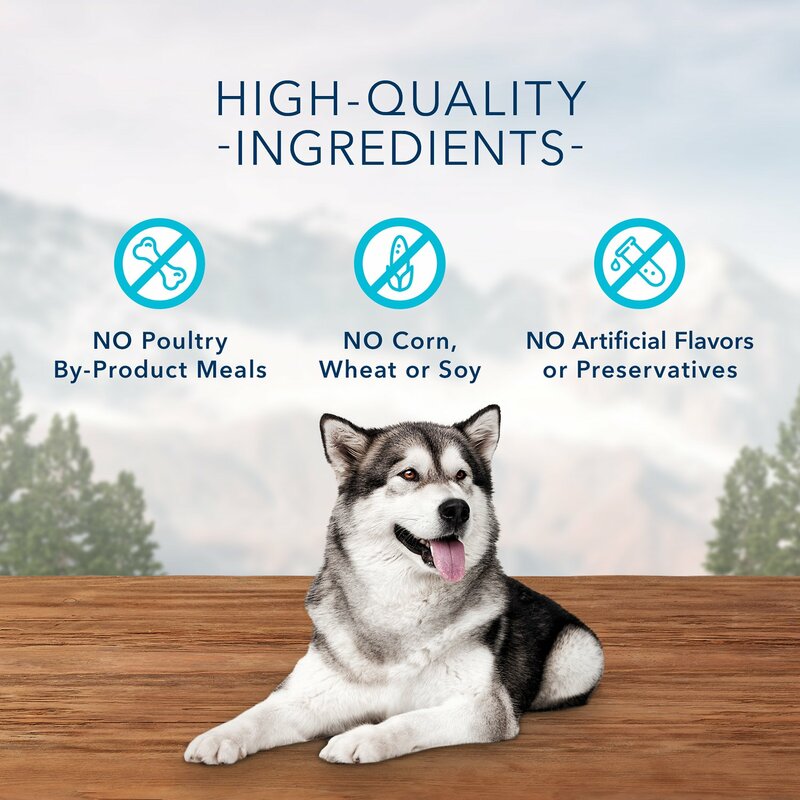 Inspired by the diet of their wolf ancestors, grain-free BLUE Wilderness gives dogs more of the high-quality real meat they naturally love, without grains. Like all BLUE™ foods, it's made from the finest natural ingredients enhanced with vitamins and minerals. Find healthy, delicious BLUE Wilderness recipes in a variety of flavors including chicken, duck and salmon. Plus look for exotic proteins like alligator, bison and more. BLUE Wilderness Wild Bits puppy/small-breed training treats contain DHA to help support their cognitive development, and omega 3 & 6 fatty acids to help promote healthy skin and coat. BLUE Wilderness Biscuits feature a wild variety of flavorful meats. Choose from bison and red meat or even protein-rich alligator and catfish, or tasty wild salmon, venison and halibut. My dogs were not impressed with this treat. I was looking for some variety to their usual treats of Primal Freeze-dried products. The freeze-dried products are far superior, their ONLY ingredient is the meat, nothing else. Since the problems with the Chinese additives in our dog food, the fewer additional ingredients is better for me! This was my first time buying these but our dog loved them and I loved the size! I added 3 more bags to my auto ship order. They’re a must have! Great value, good packaging... and dogs were very happy.. This is our dogs treat right before bedtime. She loves them! This was the first order of this treat. Bella Angel took to it right away. Now I have another option to order for her. These treats are exceptional and my two Poodles absolutely love them. These treats are very special and they become so excited when they see the bag. This is the #1 treat at our house. This is a new item for my doxie and he absolutely loves them! My son opened the package and said they look like cardboard pieces and they do but I'm guessing they are just flattened chicken that's cut up. Regardless, Chip loves them and they're small enough that I don't feel guilty giving them to him. Gotta watch a doxie's weight. I use these to help entice my senior girl to start eating her regular food. Soft and easy to chew as well. Love Chewy's selection, fast, free shipping, and great customer service.